SatTrackCam Leiden (b)log: Progress M-27M is down! 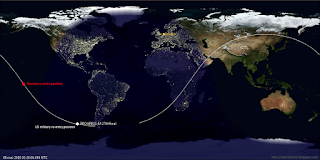 According to US military tracking data from JSpOC, the out of control Progress M-27M cargoship that should have brought supplies to the ISS, re-entered over the southeast Pacific near 51 S, 87 W, moving towards Tierra del Fuego, on May 8 at 02:20 UT, +- 1 minute. 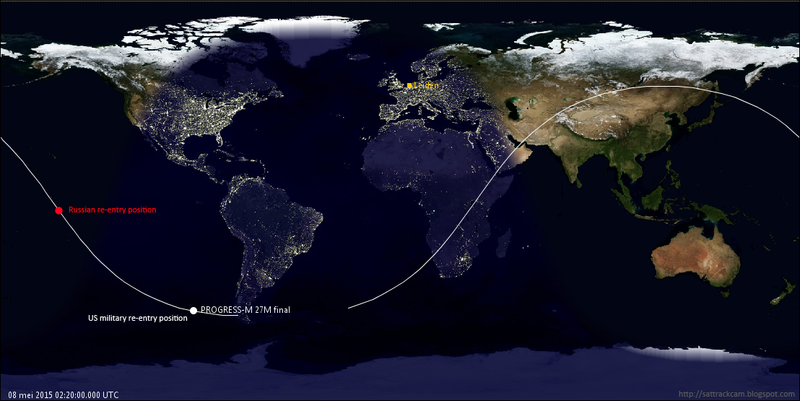 The map above shows its approximate re-entry position. Remember: re-entry in reality is a process that takes several minutes, during which it moves along the shown track (shown track is the last orbital revolution plus a small part of the track in front of the nominal re-entry position). Several analysts believe that re-entry times given to a plusminus of only 1 minute by JSpOC are based on Space-based detections by the US military's SDP DSP and SBIRS infra-red early warning satellites. These detect and geolocate the infra-red signature of the fireball caused by the re-entry. In this particular case, this is the more likely because the last three published orbital element sets from (we assume) regular tracking facilities are clearly not too accurate. So the very short uncertainty interval in the re-entry time given, must be based on some other unpublished data source. The clear problems with the last few element sets issued is one reason why I did not make any further forecasts after the one I issued at 18:30 UT yesterday, 8 hours before the actual re-entry. My prediction at that time (2:03 UT +- 2 hrs, which I rounded to 2:00 UT +- 2 hrs given the uncertainty interval) actually is not that far off from JSpOC's final re-entry time. Meanwhile, official Russian ROSKOSMOS sources give a re-entry time that is 15 minutes earlier (and very similar to my prediction hours before) than that suggested by US military tracking sources. The Russians state re-entry at 2:04 UT (5:04 Moscow time) over the central Pacific south of Hawaii (red dot on the map above). This is likely to be a 'forecast' (or 'aftercast' rather) based on tracking data and/or telemetry obtained during the hours before. No uncertainty interval is given.